Aerobic exercise (also known as cardio) is physical exercise of low to high intensity that depends primarily on the aerobic energy-generating process. Aerobic literally means "relating to, involving, or requiring free oxygen", and refers to the use of oxygen to adequately meet energy demands during exercise. Generally, light-to-moderate intensity activities that are sufficiently supported by aerobic metabolism can be performed for extended periods of time. 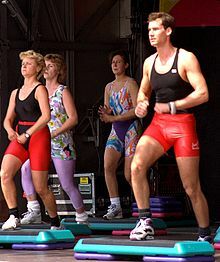 When practiced in this way, examples of cardiovascular/aerobic exercise are medium to long distance running/jogging, swimming, cycling, and walking, according to the first extensive research on aerobic exercise, conducted in the 1960s on over 5,000 U.S. Air Force personnel by Dr. Kenneth H. Cooper. Figure 15.3.1: Example of cardio exercise that is aerobic. Kenneth Cooper was the first person to introduce the concept of aerobic exercise. In the 1960s, Cooper started research into preventive medicine. He became intrigued by the belief that exercise can preserve one's health. In 1970 he created his own institute (the Cooper Institute) for non-profit research and education devoted to preventive medicine. He sparked millions into becoming active and is now known as the "father of aerobics". Aerobic exercise and fitness can be contrasted with anaerobic exercise, of which strength training and short-distance running are the most salient examples. The two types of exercise differ by the duration and intensity of muscular contractions involved, as well as by how energy is generated within the muscle. Anaerobic exercise becomes necessary when the heart and lungs can not keep up with the oxygen demands of the muscle. Remember from the chapter on energy metabolism that ATP is the energy needed for the cells in our body to live and function which includes muscle cells contraction. Within the muscle, ATP is not stored and it is quickly used in 3-10 seconds. Phosphocreatine is a very short term energy store used to regenerate ATP but it is depleted within 30 seconds. Glucose circulating in the blood or released from muscle glycogen stores is used to generate ATP and depending on availability and for intermediate exercise (65% of VO2 max) provides energy for two hours. This process is called glycolysis. When the amount of oxygen is inadequate as seen with high-intensity exercise, glucose can only be broken down to lactic acid because of a shortage of oxygen. The lactic acid accumulates in the muscle and decreases performance. Fatty acids can be used to generate ATP but this process requires oxygen to be a fuel source. Muscle cells obtain fatty acids from two sources, small stores within the muscle and circulating fatty acids released from adipose stores. Remember, fatty acids are not water soluble so they are transported on albumin or within lipoproteins as triglycerides. Low to intermediate intensity exercise for a prolonged period burns fat. Amino acids can be used as an energy source although they are not the preferred source. Amino acids are obtained from the intramuscular amino acid pool via the glucose-alanine cycle. At the most, amino acids can provide 10% of total energy. New research on the endocrine functions of contracting muscles has shown that both aerobic and anaerobic exercise promote the secretion of myokines, which are beneficial hormones, with attendant benefits including the growth of new tissue, tissue repair, and various anti-inflammatory functions, which in turn reduce the risk of developing various inflammatory diseases. Myokine secretion, in turn, is dependent on the amount of muscle contracted, and the duration and intensity of contraction. As such, both types of exercise (aerobic and anaerobic) produce quite a number of health benefits. In almost all conditions, anaerobic exercise is accompanied by aerobic exercises because the less efficient anaerobic metabolism must supplement the aerobic system due to energy demands that exceed the aerobic system's capacity. What is generally called aerobic exercise might be better termed "solely aerobic", because it is designed to be low-intensity enough not to generate lactate (or lactic acid), so that all carbohydrate is aerobically turned into energy. Initially, during increased exertion, muscle glycogen is broken down to produce glucose, which undergoes glycolysis producing pyruvate which then reacts with oxygen (Krebs cycle, Chemiosmosis) to produce carbon dioxide and water and releases energy. If there is a shortage of oxygen (anaerobic exercise, explosive movements), carbohydrate is consumed more rapidly because the pyruvate ferments into lactate. If the intensity of the exercise exceeds the rate with which the cardiovascular system can supply muscles with oxygen, it results in a buildup of lactate and quickly makes it impossible to continue the exercise. Unpleasant effects of lactate buildup initially include the burning sensation in the muscles, and may eventually include nausea and even vomiting if the exercise is continued without allowing lactate to clear from the bloodstream.glycolysis producing pyruvate which then reacts with oxygen (Krebs cycle, Chemiosmosis) to produce carbon dioxide and water and releases energy. If there is a shortage of oxygen (anaerobic exercise, explosive movements), carbohydrate is consumed more rapidly because the pyruvate ferments into lactate. If the intensity of the exercise exceeds the rate with which the cardiovascular system can supply muscles with oxygen, it results in a buildup of lactate and quickly makes it impossible to continue the exercise. Unpleasant effects of lactate buildup initially include the burning sensation in the muscles, and may eventually include nausea and even vomiting if the exercise is continued without allowing lactate to clear from the bloodstream. As glycogen levels in the muscle begin to fall, glucose is released into the bloodstream by the liver, and fat metabolism is increased so that it can fuel the aerobic pathways. Aerobic exercise may be fueled by glycogen reserves, fat reserves, or a combination of both, depending on the intensity. Prolonged moderate-level aerobic exercise at 65% VO2 max (the heart rate of 150 bpm for a 30-year-old human) results in the maximum contribution of fat to the total energy expenditure. At this level, fat may contribute 40% to 60% of the total, depending on the duration of the exercise. Oxygen is required to burn fat. Vigorous exercise above 75% VO2 max (160 bpm) primarily burns glycogen. Major muscles in a rested, untrained human typically contain enough energy for about 2 hours of vigorous exercise. Exhaustion of glycogen is a major cause of what marathon runners call "hitting the wall". Training, lower intensity levels, and carbohydrate loading may allow postponement of the onset of exhaustion beyond 4 hours. Aerobic exercise comprises innumerable forms. In general, it is performed at a moderate level of intensity over a relatively long period of time. For example, running a long distance at a moderate pace is an aerobic exercise, but sprinting is not. Playing singles tennis, with near-continuous motion, is generally considered aerobic activity, while golf or two people team tennis, with brief bursts of activity punctuated by more frequent breaks, may not be predominantly aerobic. Some sports are thus inherently "aerobic", while other aerobic exercises, such as fartlek training or aerobic dance classes, are designed specifically to improve aerobic capacity and fitness. It is most common for aerobic exercises to involve the leg muscles, primarily or exclusively. There are some exceptions. For example, rowing to distances of 2,000 m or more is an aerobic sport that exercises several major muscle groups, including those of the legs, abdomen, chest, and arms. Common kettle bell exercises combine aerobic and anaerobic aspects. Overuse injuries because of repetitive, high-impact exercise such as distance running. Is not an effective approach to building muscle. Only effective for fat loss when used consistently. Both the health benefits and the performance benefits, or "training effect", require a minimum duration and frequency of exercise. Most authorities suggest at least twenty minutes performed at least three times per week. Aerobic capacity describes the functional capacity of the cardiorespiratory system, (the heart, lungs and blood vessels). Aerobic capacity refers to the maximum amount of oxygen consumed by the body during intense exercises, in a given time frame. It is a function both of cardiorespiratory performance and the maximum ability to remove and utilize oxygen from circulating blood. 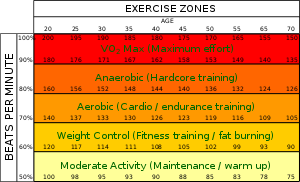 To measure maximal aerobic capacity, an exercise physiologist or physician will perform a VO2 max test, in which a subject will undergo progressively more strenuous exercise on a treadmill, from an easy walk through to exhaustion. The individual is typically connected to a respirometer to measure oxygen consumption, and the speed is increased incrementally over a fixed duration of time. The higher the measured cardiorespiratory endurance level, the more oxygen has been transported to and used by exercising muscles, and the higher the level of intensity at which the individual can exercise. More simply put, the higher the aerobic capacity, the higher the level of aerobic fitness. The Cooper and multi-stage fitness tests can also be used to assess functional aerobic capacity for particular jobs or activities. Higher intensity exercise, such as high-intensity interval training (HIIT), increases the resting metabolic rate (RMR) in the 24 hours following high-intensity exercise, ultimately burning more calories than lower intensity exercise; low-intensity exercise burns more calories during the exercise, due to the increased duration, but fewer afterward. Aerobic exercise has long been a popular approach to achieving weight loss and physical fitness, often taking a commercial form. Sharon A. Plowman; Denise L. Smith (1 June 2007). Exercise Physiology for Health, Fitness, and Performance. Lippincott Williams & Wilkins. p. 61. ISBN 978-0-7817-8406-1. Retrieved 13 October 2011. Kenneth H. Cooper (1997). Can stress heal?. Thomas Nelson Inc. p. 40. ISBN 978-0-7852-8315-7. Retrieved 19 October 2011. William D. McArdle; Frank I. Katch; Victor L. Katch (2006). Essentials of exercise physiology. Lippincott Williams & Wilkins. p. 204. ISBN 978-0-7817-4991-6. Retrieved 13 October 2011.
Cooper, Kenneth H. (1983) . Aerobics (revised, reissue ed.). Bantam Books. ISBN 0553274473. Wayne, Jake (14 June 2011). "Aerobic Vs. Anaerobic Fitness". LIVESTRONG.COM. Retrieved 21 April 2013. "Fat vs. carbohydrate metabolism during aerobic exercise". Matthew J Watt; et al. (June 2002). "Intramuscular triacylglycerol, glycogen and acetyl group metabolism during 4 h of moderate exercise in man". J Physiol 541 (Pt 3): 969–78. doi:10.1113/jphysiol.2002.018820. PMC 2290362. PMID 12068055. "Aerobic exercise: the health benefits". myDr. 11 January 2010. Retrieved 17 May 2016. "Cardiovascular fitness is linked to intelligence". 'aerobic exercise', Food and Fitness: A Dictionary of Diet and Exercise, Michael Kent, Oxford University Press, 1997. Hebestreit, Helge; Bar-Or, Oded (2008). The Young Athlete. Blackwell Publishing Ltd. p. 443. ISBN 978-1-4051-5647-9. Retrieved 29 July 2014. Bouchard, Claude; Ping An; Treva Rice; James S. Skinner; Jack H. Wilmore; Jacques Gagnon; Louis Perusse; Arthus S. Leon; D. C. Rao (1 September 1999). "Familial aggregation of VO(2max) response to exercise training: results from the HERITAGE Family Study". Journal of Applied Physiology 87 (3): 1003–1008. PMID 10484570. Retrieved 2007-07-17. Kolata, Gina (February 12, 2002). "Why Some People Won't Be Fit Despite Exercise". The New York Times. Retrieved 2007-07-17. Clearinghouse on Counseling and Personnel Services. Aberg MA, Pedersen NL, Torén K, Svartengren M, Bäckstrand B, Johnsson T, Cooper-Kuhn CM, Aberg ND, Nilsson M, & Kuhn HG. (2009) Cardiovascular fitness is associated with cognition in young adulthood. Proceedings of the National Academy of Sciences of the United States of America. Guiney, Hayley & Machado, Liana. Benefits of regular exercise for executive functioning in healthy populations. Psychon. Bull. Rev. 2013. Rendi, Maria, Szabo, Atila, Szabo, Tomas, Velenczei, Attila & Kovas, Arpad. Acute psychological benefits of aerobic exercise: A field study into the effects of exercise characteristics. Psychol, Health. Med. 2008.